For Badiou our society is one of “democratic materialism”, whose constitutive principle is that there are only bodies and languages. This world is the reign of clichés and stereotypes, of common images and of (individual and collective) particularisms. What Badiou’s philosophy elaborates begins from this world -the only World – and does not deny it, but adds that there are also Truths that we can accede to and Ideas that we can be incorporated into, thus losing our particularistic identities and gaining universality. There is no pure world of Ideas, and so our world is doubly impure: a mixture of bodies and languages, which is remixed with Ideas and Truths. The cinema, as Badiou analyses it, would seem to be the most appropriate art-form to present and describe such an impure world, and also to adapt us to its situations, and to the decisions that must be made therein. Cinema is not didactic (top-down) in the sense of imposing an Idea from above, but rather pedagogical (bottom-up), in that it takes us from our immersion in democratic common identities and raises us to more aristocratic perceptions and emotions. Cinema thinks by means of its impurity, Badiou tells us: its basic material is stereotypic and identitarian, but it can take us from identities to Ideas, from stupidity, where the State and its categories have won, to hope, where love and equality have gained enough sporadic victories to show us that “All is not lost” (cf page 231). It is not necessary to know the details of Badiou’s philosophical system to read with profit this collection of his writings on the cinema. 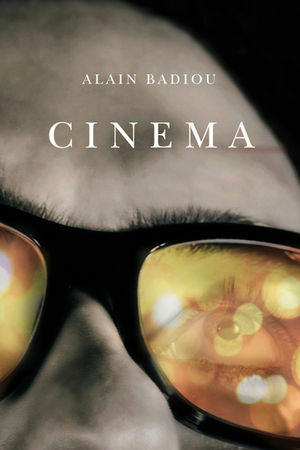 For Badiou the cinema is an impure and pedagogical art that lifts us immanently from the world of stereotypes and clichés to the world of Ideas. Cinema, the book that Antoine de Baecque assmbled out of Badiou’s dispersed writings on the cinema, incorporates this same movement. The book is a heterogeneous assemblage, of approaches and perspectives from different epochs of his life, and of ideas and analyses from different phases of his philosophical development, that do not quite cohere into a philosophy of cinema. Quite frankly, much of what Badiou has to say about the cinema is not all that new, nor does it present a completed picture. Badiou admits that he is not writing as an expert, in the mode of knowledge, but as a cinephile affected by films and as a philosopher seeking to express the effects for thought of these films, in a poetic and meditative mode. It is useful to know that art (called by Badiou the “poem”) is one of the four conditions of philosophy, along with science (the “matheme”), politics and love. These are the conditions of philosophy rather than its objects, as philosophy does not itself produce truths, but rather gathers together those produced by the four conditions into a common conceptual space (the historical “conjuncture”). Art is a condition of philosophy because it thinks and produces truths on its own, without the aid of philosophy. This is the principle of what Badiou calls his “inesthetics”. Thus cinema is not properly speaking an intellectual object for philosophy to think, but a mode of thinking producing its own thoughts, or “cinema-ideas”, that philosophy can rethink as part of its configuration of the Ideas of an epoch. In Chapter 15 Badiou analyses the cinema in terms of three movements (global, local, and impure), but these same movements structure the book itself. We can read Cinema for the global movement of his philosophy of the cinema, in which case we can turn to the synoptic interview in Chapter 1, where he discusses the various phases of his thought on the cinema in chronological order. Or we can go directly to Chapter 27 (“Cinema as Philosophical Experimentation”) to find the most complete, but neither final nor fully coherent, statement of his ideas. In this movement we go from cinema as a cultural, then political, then poetic then philosophical situation, to cinema as a “metaphor for contemporary thought”. This last phase allows Badiou to condense in a single formula his synthesis of cinema’s cultural, political, poetic and philosophical dimensions. We may be more interested in following the local movement of Badiou’s analysis of particular films. In this case we can refer to Chapter 22 on Antonioni’s Identification of a Woman (1982), Chapter 29 on Godard’s Tout va bien (1972), or Chapter 31 on Clint Eastwood’s A Perfect World (1993), amongst many other examples. Badiou has interesting and insightful things to say about a wide variety of particular films. The empirical pedagogy of his encounters with singular works is doubled by the dialectical pedagogy that Badiou discerns in each work’s treatment of its impure material (lived situations, music, painting, theatre, architecture, melodrama, circus, cabaret), not negating the material but transforming it from within. For Badiou cinema is a form of alchemy which takes the base material of the spectacular, the violent, the obscene and the stupid, and that sublimates it into a new and pure simplicity. Alongside the global and the local movements and traversing them, Badiou distinguishes a third type that he calls the “impure movement”, and that he considers to be the source of the “poetics”of the cinema. The basis of this impurity lies in the “paradoxical relations” that constitute the cinema as it juxtaposes figures and modes of existence that have nothing in common, and forces us to create new syntheses that overcome metaphysical dualism. “Metaphor” is a name both for the cinematic language that unmakes the dualism between sensible and intelligible, and for Badiou’s language when it follows the same movement. In Cinema Badiou uses his philosophical meta-language in a freer, more fluid, more poetic style than in his more systematic works. Being, event, multiplicity, and truth are employed in a way not incompatible with his system but that resonates more widely. Herein lies the distinctive contribution of Cinema both to Badiou’s oeuvre and to contemporary thought. The book allows him to traverse various ideas and experiences of the cinema, and to elevate them to a poetic beauty and a synthetic power that move us both affectively and intellectually. If cinema is a “metaphor for contemporary thought”, and if we are contemporary with a movement towards “philosophy as cinema”, as Badiou concludes, then Badiou’s philosophy is itself a metaphor for that thought, a synthesis of diachrony and multiplicity which we may call “cinematic pluralism”.